It has a universal appeal, a chocolate chip cookie. I've yet to meet a child who would not eat it. I'm all grown up (I like telling myself this), but I still crave it every now and then, like every 6 hours or so.. Kidding. Okay, maybe not. Why do you think did I need to make a healthified version? Besides, media and popular culture make it hard for us to keep our children from wanting the treats they see on TV, at stores and in their classmates' snack bags. One of the foundations of healthy eating is balance, and there are studies proving that depriving kids of certain foods only increases their desire for it. So, personally, I think it's important for kids to be allowed treats in moderation. However, allowing them the occasional treat does not necessarily mean throwing good sense out of the window. Unless you're at the mall, in which case I won't judge. But when at home, making the effort to prepare them homemade food allows you to put in as much goodness as you wish; and keep out the preservatives, chemicals and additives found in store-bought food. I admit it takes a bit of effort, but the 30-60 minutes on a Saturday afternoon is more than worth it. Note though that these are not low-calorie cookies. That's not why they're 'good'. Growing children need energy and this cookie is a good source of it (consumed in moderation, of course). This recipe is also not very forgiving, I will admit that. It took me about 7 tries before I got the texture right, so I cannot assure that any modifications or substitutions (apart from the ones noted) will result in the same taste or texture. 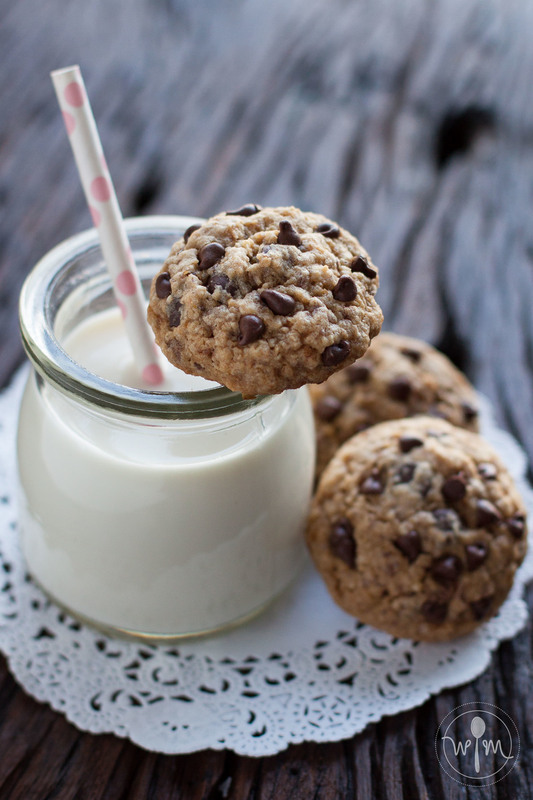 These chocolate chip cookies are the tasty kind of 'good'; and the nutritious kind of 'good'. They're sweet, sure, but they have a load of protein, omega-3 fatty acids, B vitamins and soluble and insoluble fiber. And they're awesome with coffee. In a medium bowl, whisk together the pastry or all-purpose flour, oat flour, baking soda, cream of tartar and salt. Set aside. In a large mixing bowl, cream the butter and sugar. Beat in the egg and vanilla extract. Whisk in the flaxseed and water mixture (which should be paste-like after the 5-minute soaking time). Add the brown sugar and mix well. Using a wooden spoon, blend in the flour mixture until just moist. Don't overmix, a few lumps is fine. Fold in the wheat germ, oat bran, walnuts and all the chocolates until just blended. Scoop one-tablespoonfuls of the dough set 2 inches apart on an ungreased cookie sheet. Bake in preheated oven for about 8-10 minutes. Cool in sheet for 5 minutes before removing and setting on a wire rack to cool completely. Store in an airtight jar at room temperature and consume within 5 days. You can make your own oat flour by grinding rolled or quick-cooking oats in a food processor or coffee grinder. You can also take your oats to the local market, and have it ground by the people who grind rice for puto makers. Flaxseed meal and wheat germ are available in most supermarkets, usually in the section where you find oats, grains and pulses. I get mine at Healthy Options. Whole wheat pastry flour is available at Healthy Options. Take note that there is hard whole wheat flour, which is for breads, and will not work the same way as flour labeled specifically for pastry.